Recently, wholesale and trade and manufacturing companies are faced with the problem of inefficiency in core business – sales. The majority of market participants work according to the scheme “manager – price list – phone – mail – client”. This approach often leads to gaps in communication between the supplier and the dealer, puts the company in dependence on specific employees, accidents and the human factor. We optimize the business processes of the supplier-dealer interaction and create effective supply management systems. Mega Web Design is one of the well-known B2B portal development company in India that enables better collaboration with SME partners. It is an ergonomic web application that allows the user to use modern sales channels even with the smallest customers. A user-friendly, graphical, customized interface provides a quick and easy way to manage all purchasing processes. In addition, the manufacturer/distributor can provide up-to-date information on new products or planned marketing campaigns. To enable quick and easy ordering of products, we have created an integrated mobile application (barcode scan) that allows access to your company’s products wherever and whenever you want. Reduction of costs for trade and procurement processes: most of the tasks can be solved with the help of the portal without the participation of employees of the company. Optimization of pricing policy: discount systems, tenders and auctions allow you to get the best offer at the price. Improvement of the level of customer service in the b2b sector. Online information exchange: tracking order statuses and automatic notifications for customers of the b2b area. Business-for-business portals are the most complex resources for interacting on the Internet. They combine several corporate portals with their hierarchy, levels of access to information, should provide the opportunity for online communication and other services available at the moment in the Internet. 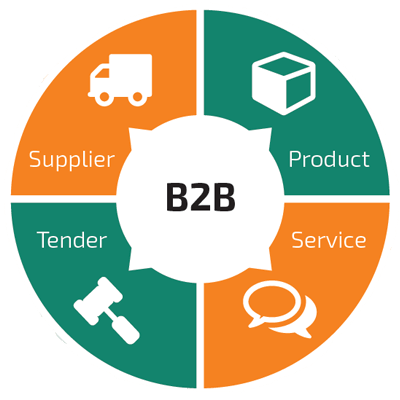 B2B portals – the most responsive to changing the Internet technology market resources. Why Choose Us for B2B Web Development? We are developing projects for wholesale companies for years, so we understand the specifics of the industry. Thanks to experience, we have the knowledge that we are ready to share. We will talk about the features of wholesale systems and frequent mistakes. Own development allows you to adjust to the processes of the company and carefully implement the customized system in accordance with the task. It is important for us to pinpoint the problem and find the best solution, so the projects are conducted by IT specialists without a “spoiled phone” manager. The system is designed taking into account the tasks of scalability, stability to burglary, active protection and stable operation without data loss under high loads. In the process of development and implementation – 60% of the time and effort should be given to analytics, and 40% – technical processes: design, development, programming and testing.